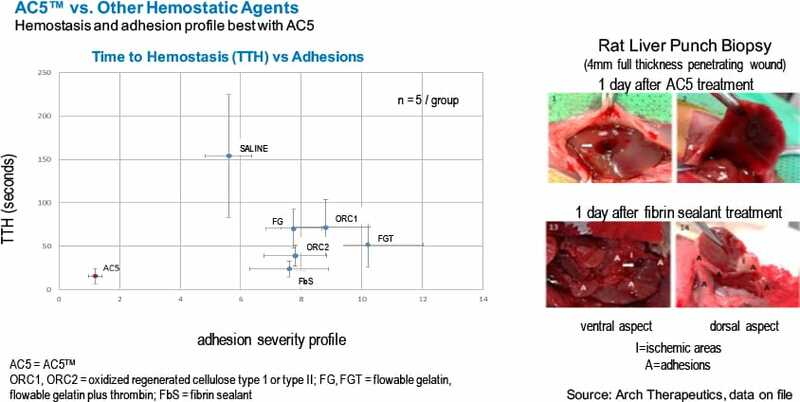 When applied onto a wound, AC5™ rapidly intercalates into the nooks and crannies of the tissue as it builds itself into a physical, mechanical wound-filling structure. Worked equally well in heparinized or control animals, and animals with/without antiplatelet agents. Demonstrated hemostatic properties in liver and other organs in in vivo surgical models, including durable hemostasis within15 seconds. SAP compositions have been tested in small animal organs (i.e. liver, skin, muscle, brain, eye, spine, spleen, arteries and veins). In mammalian vision models (severed hamster optic tract), SAPs have demonstrated reversal of blindness by providing a scaffold to allow regenerated axons to connect to target tissues. In ocular tissue pilot studies, SAPs demonstrated biocompatibility and the ability to rapidly and reliably stop bleeding (Figure ) and limit inflammation. Sclera of a rat eye (A) is punctured with a syringe at the limbal artery (B) and bleeds profusely (C). The eye is then treated with SAP (D). Bleeding stopped in 8 seconds and remained stopped for the duration of the observation (15 minutes). Pressure applied to the cornea did not dislodge the material from the sclera (F). Hemostasis was maintained even with repeated manipulation of the eye. Ellis-Behnke R, Liang Y-X, You SW, et al. PNAS 2006;1033:5054–9. Data on file, Arch Therapeutics.